Again I add another wash to the background to deepen the value. This time I used very wet puddle of Indigo. 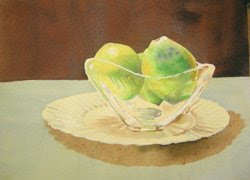 This cooled the background color, darkened the value and really made the fruit pop. I used variations of Indigo (very wet!!! ), VanDyke Brown, French Ultramarine Blue and Burnt Sienna to further develop small areas of detail around the bowl, fruit and plate. Remember to spend more time looking at the reference than you do painting. Look for value, shape, color, and edge quality - crisp edges require an application of wet paint on dry paper, soft edges require clear water on the softened edge of the pigment either before or after the stroke is made. After tweaking a few small areas, I think it is done!